Is Arjun Mahendran back in Finance Ministry? It is reported that former Governor of Central Bank Arjun Mahendran, who is accused of the Central Bank bond scam, is serving as an adviser to the Ministry of Finance. It is reported that Arjun Mahendran participates in Finance Ministry meetings as an adviser. It has been revealed that Arjun Mahendran has participated in meetings held by the Minister of Finance on Tuesdays and Thursdays at 5.00 p.m. in which the Governor of Central Bank Indrajit Coomaraswamy, R. Paskaralingam and Dr. R.H.S. Samaratunga, the Secretary to the Ministry participate. The latest meeting had been held at the Ministry of Finance on 6th January, 2017 and at this meeting Arjun Mahendran has, as usual, advised Central Bank Governor Indrajit Coomaraswamy what decisions the Monetary Board of the Central Bank should take. This is a violation of the Monetary Law Act. Enrolling new students to science and agriculture faculties in Universities have been reduced from 23% to 25% during the past five years point out University Teachers for Social Equity. This was stated at a press conference held in Colombo yesterday (22nd). Prof. Chandana Abeyratne of Faculty of Humanities of Kelaniya University, Dr. Anura Karunatilleke from the Department of Mathematics, University of Kelaniya, Dr. Ajith de Mel from the Department of Mathematics University of Ruhuna, Dr. Jinasena W. Hewage from the Department of Chemistry of University of Ruhuna, Senior Lecturer Deva Michel De Silva of Department of History of University of Ruhuna, Upali Panwilage of the Faculty of Humanities and Social Sciences, University of Ruhuna, Dr. Athula Samarakone of the Open University and Asela Rangadeva of the University of the Visual & Performing Arts participated. Speaking further Dr. Anura Karunatilleke from the Department of Mathematics, University of Kelaniya said despite the UGC stating in its official documents that 3500 students would be enrolled for science faculties, during past 5 or 6 years there has been a shortage of about 703 students for these faculties and the UGC never mediates to fill the vacancies. He said university academic staffs have on several occasions had discussions regarding the issue with the UGC but it has not been able to present a scientific programme to enroll the needed number of students. He emphasized that there are many students who have the necessary qualifications but are not able to get a university education despite the fact that many of them could be enrolled if the UGC comes up with a programme to fill the vacancies that occur every year for science faculties. 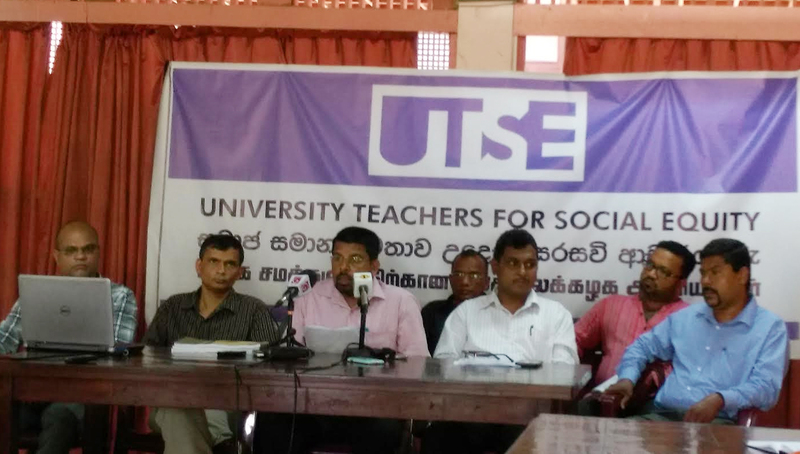 Dr. Anura Karunatileke said despite officially stating 23,000 students are enrolled to universities annually, the actual number enrolled is less than that.